I think it's fun to see what lights you all are using and how you use them day to day So, what was the last light you used and how was it used? The last time I used a flashlight was last night going to bed at 3am. I used my Vollsion SP-11S in low to get ready for bed without waking the wifey. 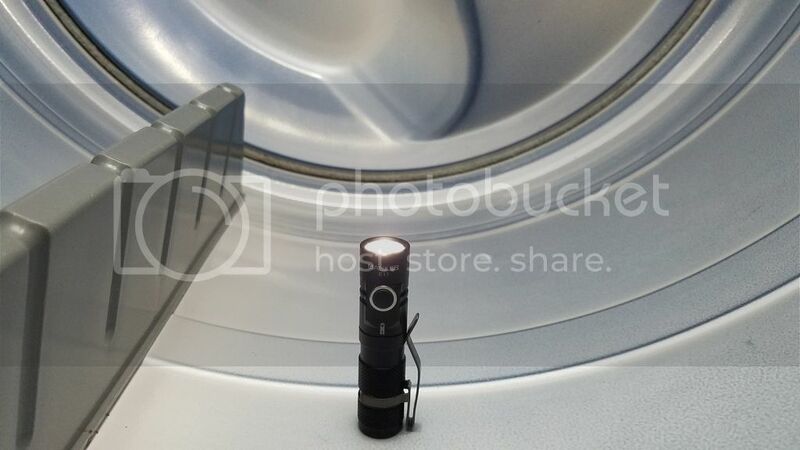 Used a Manker E11 to change the light bulb in the dryer. Handy little light. This afternoon I used an Olight S15R with reversed clip on a cap as a headlight for checking the electric wiring in the house. The Olight clips are a great and versatile design. Perfect for ball cap headlamps. This evening I was at a party and used my Reylight Ti triple Nichia (part of my EDC rotation) as a yard sweeper to check out the back of the host's property. Hikesalot, that drier pic is awesome! Zebralight SC62w to flash back into the den to make sure the front door was locked. Any excuse! Any...... Excuse! Olight S15R... to light my way to the barn. I could have turned on the yard light but the S15R was clipped to my pocket as always. Heh...I hear you guys. Taking out the trash...any excuse. I prefer to check the doors in the house every night via torch light instead of turning on the lights. Then I make my way up to the bedroom and get ready to bed via torch light as well. I always seem to come to bed far later than the wifey and a nice moon mode makes sure I can do it without disturbing her. Mag solitaire led this afternoon looking inside a printer looking for a paper jam. Just the right level of light for that sort of job. My UF-1504 (PC amber emitter from Mtn) at about 3am to figure out where the cat was barfing. Didn't get up, just noted where not to step if I did need to get up any time before dawn ... back to sleep. Heheh...yeah, I don't miss fixing those things. I'd be writing every day that I used my Thrunite Ti HI to lock up the house and head up to bed. Last evening I performed some testing in the basement for a couple of upcoming reviews. Tested output levels of an Olight R50 and it's competitor, an Acebeam EC50 II. Two visually similar lights with opposite personalities and performance. Neither will make their claimed max output. I will have to retest throw on the EC50 as it is FAR less than claimed while the R50 is just a touch higher than claimed. Judging by direct comparison of the two on a wall, I think I will get the same results. ar about 2 in the morning, I just used a UniqueFire 1508 75 mm head AS lens lamp, with an IR emitter to illuminate a dark corner of a paddock below my house so I could use a McLellan Night vision device to see if there was soneone or something in the field with the horses. THat sounds like a pretty sweet setup! I need to get myself some night vision goggles and a bright IR light. Only reference to this manufacturer is a obscure report in to the arms industry from 1995 ! I use my strongest to light up the area when I take my buddy , Mick(our dog), out for his before bed relief trip. many wild critters here in the Western NC mts.